Monogrammed necklace charms! 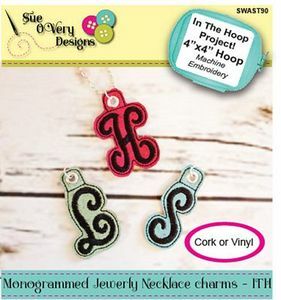 These quick easy charms can be made using an embroidery machine and made entirely in the Hoop, In the Hoop, with no extra sewing required. The enchanted monogram is elegant and easy to read. Stitch on any non-woven material, such as Cork or vinyl. Finish the edges off with fabric glue and use a 5/8in rivet and large spring ring for use as a necklace charm or key chain. Finished measurements depend on size of letter but approximately 1in w x 2in tall. Perfect Cork scrap buster. Each letter requires less than a 3in square for front and 3in square for back.